Our country is now heading towards tyranny! And it is our combined ignorance and apathy that is letting this happen! The truth is that we are all being scammed on a truly massive scale. The Brexiteers are being deceived! The Remainers are being deceived! And the rest of us are also being deceived! An Orwellian future of corporate ‘Big Brother’ control awaits us all if we don’t wake up quickly. Our Common Law Trial by Jury Constitution is being trashed and will be lost to us forever if we don’t act. We currently allow a tiny number of unelected and unaccountable people to control the world’s money supply by simply creating money completely out of thin air as debt. And we now have a highly intrusive surveillance society (so often warned about in literature and films) in place where hundreds, if not thousands of Roman Civil Law ‘Acts’ and ‘Statutes’ micro-manage our lives – in other words, we have allowed a form of governance to exist whereby corrupted politicians, bankers and lawyers, all working in cahoots, tell us what we can or cannot do. We, as a country, must now regain and restore our full sovereignty and our ability to govern ourselves in a truly democratic way. No longer will we tolerate or allow the proverbial ‘one per cent’ to unlawfully control our lives. As our forbears did in early Victorian Britain, we must all now come together as a mass movement, regardless of race, creed, colour or social standing, to peacefully, but determinedly, reclaim what is rightfully and lawfully ours. We don’t need leaders or inflated egos, we just need to get out there with the proven truth along with the tried and tested solutions. So let’s get organised and get the job done! A presentation on the New Chartist Movement and how you can get involved by setting up a local movement here in Hull. 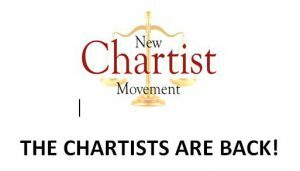 Today, as the New Chartists – the ‘Chartist’ part now refers to the 1215 Great Charter (Magna Carta) – we, too, have a list of six Requirements and because we are exposing proven and current High Treason and appalling financial fraud within Parliament, the Judiciary and the City of London – not to mention the small matter that we also represent 99% of the people – we will not be overcome or dispersed until the job is done. We are going nowhere until all the injustice, hardship and suffering stops! 1. That the People are ultimately Sovereign… by restoring the supremacy of our Trial by Jury Common Law Constitution, as confirmed by the 1215 Great Charter, along with the absolute right of a randomly selected Jury to annul bad and flawed legislation (statutes) passed by the agenda-driven, self-serving politicians in Parliament. 2. That Poverty and Austerity be ended immediately… by the reinstatement of the fiscal process known as Sovereign National Credit whereby HM Treasury creates and issues debt-free and interest-free money that is based entirely on the wealth and labour potential (creativity) of our nation. This will involve restoring the 1914 Bradbury Pound which prevented a financial collapse at the outbreak of the First World War. To support this, we will be making a full exposure of the fraudulent activities of the privately controlled Bank for International Settlements and its debt-creating central banking system, which includes the Bank of England. 3. That Children must be protected from Establishment-led abuse… by abolishing the secretive and corrupt Family Courts, along with the setting up of a new and properly run public inquiry involving a randomly selected Grand Jury to investigate thoroughly, without fear or favour, the alleged abuse of children by people in positions of trust and authority, some of whom, it is alleged, are holding, or have held, positions at the very highest levels of government. 4. That our Armed Services and Police Service be shielded from further cut-backs… by immediately withdrawing from the proven and treasonous process to unify our already deliberately depleted Armed Services with those of the European Union; whilst at the same time annulling the process to privatise and corporatise our Police Service, including giving private security firms the powers of arrest. Those men and women who are seeking to serve and defend us are being deliberately emasculated so as to allow our treasonous political class to end our country’s ancient freedoms and sovereignty and our Common Law Trial by Jury Constitution. 5. That the fraud and deception of our Legal System be ended… by exposing and collapsing the alien and parallel legal system that some say evolved from the 1666 Cestui Que Vie Act which seemingly allows ‘Legal Fictions’ to be created when our parents are compelled to register a birth and so receive a ‘Birth Certificate’ for their new-born. There is provable evidence that a legal, but definitely not lawful, system of deception and entrapment exists (using the deliberate and unfathomable language of ‘legalese’) where you find that our Courts of Justice are listed by Dun and Bradstreet as corporations so as to make them places of business and not justice. It is a system whereby Roman Civil Law (also known as Maritime Law and Napoleonic Law) is allowed by open treason to operate without hindrance in our Common Law Trial by Jury country with the open acquiescence and complicity of the Judiciary. 6. That true Justice in the Courts be restored… by bringing to trial those rogue judges, lawyers, auditors and bankers who are, or have been, involved in fraudulent bankruptcies that have stolen billions of pounds from totally innocent victims, not to mention carrying out large-scale money-laundering exercises in order to hide their criminally obtained money. £5 Waged/ £3 Un-Waged / Donation / or whatever you can manage even if that is nothing. Truth Juice Hull is NON-PROFIT making supporting local charities and the venue is FREE. Lack of money will never be an issue with attending the talks. Admission: £5 Waged/ £3 Un-Waged / Donation / or whatever you can manage even if that is nothing.